We have our fourth dog training class tomorrow morning. We signed up for this class at a local community college because in all honesty, our dogs are nuts. They are impossible to take on walks, they jump on visitors, they beg for food, they make a mess… you get the idea. We would actually be fine living this way. We’ve learned to leave them outside when we have visitors and we walk them separately. We probably encourage the begging, but part of us thinks it’s cute. The mess, well, that’s life with animals and we’re not really OCD cleaners. The main reason for starting training? Babies. We’re planning on starting a family soon and I want to be able to safely go on a walk with a stroller and two dogs. Am I living in a fantasy land? Probably. Am I still going to try to change our dogs (and our) behavior? No harm in trying. We’re hoping for this kind of result! Our trainer recommended a “slip chain” which is a PC way of saying “choke chain”. There really are two ways to put it on, one way causes it to choke the dog without loosening, the other allows for a jerk and release to send a quick signal to the dog for inappropriate behavior. We bought one for each of our fur-babies and got to work. I would walk each dog individually after work before it got dark (pre-daylight savings) and try my best to drive “leave it” and “heel” into their little brains. During our second class, I was a bit under the weather and had Teddy for the second half. He’s a big puppy, not quite a year old and almost 70 lbs. He can drag me down the block, but I try to anticipate his moves and get him in line before he starts to misbehave. Off the leash, he is great. Plays well with other dogs, never has had a problem. On the leash, he’s a different animal. At the very end of class, we weave in and out of the circle of dogs to show that they can “leave it” or ignore everyone else and just pay attention to the handler. I was weaving and Teddy was ok until we got to one dog that seemed to have an issue with him. I told the trainer, but she told me to go next to this dog and Teddy lost it. I ended up with him behind me holding the leash between my legs. I was putting all my weight and strength into pulling him away, but the trainer had to save me. She put him on his back and ended the battle. After that, she recommended we get a gentle leader. Magic!! This thing is seriously amazing. 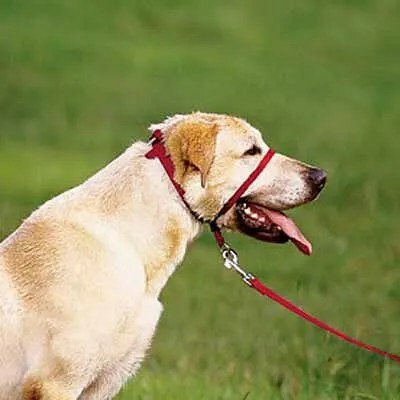 We basically have to forget everything we learned about the jerk and release we use with the “slip-chain” as that will hurt the dog’s neck with the gentle leader. However, it has completely changed how he is on walks. He doesn’t pull at all anymore. If he starts to go to fast, I gently pull on the leash and he slows down. I can actually take them both on walks together. It is amazing. Granted, he still gets crazy when he sees other dogs and he’s on the leash, but he is much easier to control. Any tips for fearfully aggressive dogs (Teddy)? What about chubby hyperactive dogs (Ruby)? ← Oh Boy, Oh Boy! No – but if you figure things out with Teddy please let me know! Eleanor has the same fear-aggression going on and it's embarrassing to walk her. Dude, we really do own the same dog. This is so weird.